You'll be £19.99 closer to your next £10.00 credit when you purchase This Bloody Place. What's this? Captain Albert Mure, a company commander in the 5th Battalion The Royal Scots, spent forty-three days in Gallipoli - far longer than many men who fought there would survive. In those few weeks, this brave, stoical officer was reduced from a fit, determined leader of men to a physical and mental wreck. 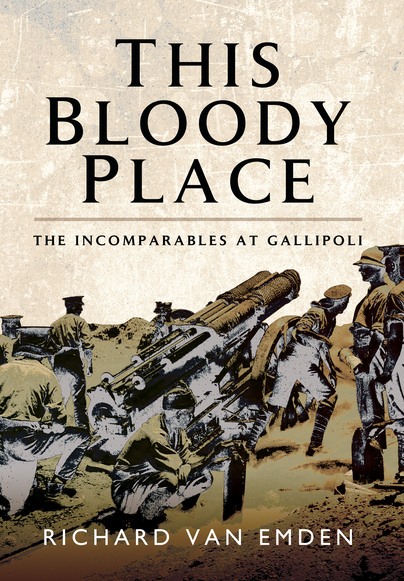 Originally published in 1919, Mure's story of his experiences at Gallipoli is full of a rawness and immediacy that I believe makes it worthy of a place amongst the many Great War memoirs. A republishing of the diary of Major A. H. Mure (first produced in 1919) who as a Captain in the 5th Royal Scots spent forty-three days in Gallipoli, where he was reduced from a brave, fit, stoical and determined leader to a physical and mental wreck of a man. This well written diary is an honest and endearing account which engages the reader's interest and attention from start to finish. Mure's sympathy for those under his command is readily apparent and, though suffering from shell-shock himself, when the time came to leave he felt like a deserter, remarking hauntingly, 'you can carry a no longer fit soldier's body out of the firing line, but not his soul'. Mure died aged 64 in 1943 but his writing is some of the best of the war era and this diary rightly deserves to become a classic of the Great War. This truly remarkable book was second in line for Editor's choice this month and is one that readers will certainly want to add to their bookshelves.